As chiropractors in Wichita we want all of our patients to feel immediately at home when they walk in the door. Since chiropractic care involves a series of visits, with each one building on the ones before, it’s important for you to feel comfortable right from the start. You’ll be greeted by one of our friendly staff members. You’ll find plenty of convenient parking only steps away from our front door and a well-lit parking lot. You’ll be greeted by name when you enter our office. 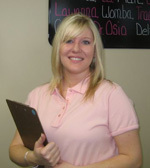 Our staff are warm and friendly people who care for your every need. If you’ve already completed your admitting paperwork, great! If not, that’s okay too! A clip board and pen will be given to you with a short entry form. After completing your paperwork, you will be invited back for a consultation with the doctor. The purpose of your consultation with the doctor is to discuss your health goals and see if chiropractic and/or acupuncture is likely to help you. If it looks promising, a thorough examination will help identify the cause of your problem. Allow 30-45 minutes for your first visit. This time may be less if you choose to complete your admitting paperwork in advance. Depending upon your personal health needs, Dr. Wheeler may offer a relief treatment at this time. We don’t expect miracles, but gladly accept them if they happen. Call our Wichita Chiropractic office today or see what the Second Visit looks like, by clicking here.